This particular drink recipe has helped with my digestion problems in a great way. Digestion problems… they were rearing their ugly head again. It was so bad, it hurt to eat! And I love eating, so it was becoming a love/hate issue. I love eating, but I hate the way I feel afterward. I haven’t had any digestive issues in about, say, five years. That’s back when I realized I was following all the wrong health advice. You know, the advice that says fiber bars are super great to eat every day — my stomach is oh-so-glad I stopped that habit! Since then, I’ve been taking better care of myself in many ways, and my minor digestion problems simply disappeared along the way without me ever really thinking about it. I knew why I was having digestion problems. The answer was incredibly simple: stress. I’ve been under some stress — okay, a heck of a lot of stress — during the past year. I do my best to sleep well and eat well to help support my body during this time, but it started catching up to me. And that’s when the digestion problems started. What does stress have to do with digestion? A lot actually. Stress hormones directly affect your digestive health. For starters, stress hormones like cortisol will restrict blood flow to the digestive system — since if you’re being chased by a lion, you need to worry more about blood pumping to your heart, lungs and legs than your stomach. Of course, we’re not being chased by real lions as much as emotional and mental ones, so these days this biological function often does more harm than good. So my first goal is to continue to find positive ways to cope with stress, reducing stress when possible (though that’s not always available). The next step on my journey was to practice what I always preach: listen to my body! Since my digestive system has become a little more sensitive during the past few months, I noticed that some foods definitely do NOT agree with me! Fiber-rich foods and most vegetables immediately bring my digestion problems to the surface. It goes against conventional health advice to cut back on these foods, but I know that tuning into your digestive system is important — eating foods that irritate your gut can cause inflammation, which is the last thing a stressed digestive system needs. So I’m working on getting nutrients from others foods while my body obviously isn’t in the mood for certain things. So, while I’m working to reduce stress and avoid a few foods that don’t agree with me right now, I also wanted a natural remedy to help alleviate digestion problems in everyday life. Funny enough, I’d been craving ginger-flavored everything lately. 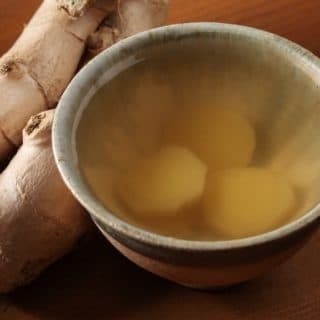 It struck me that ginger is actually incredibly supportive of digestive health — in fact, it’s been a natural remedy for digestion problems for ages (ginger has a lot of health benefits actually). Ginger tea is easy to make and quite affordable, so I figured, why make it more complicated than that? Ginger has been a lifesaver in the past couple of weeks for me! I try to drink my ginger tea at least twice a day, and especially after heavy meals. Bloating, stomach pains, gas… all those icky symptoms of digestion problems drastically improved within a couple of days. I would say this step alone has eliminated about 80% of my symptoms. Nice, right? As a side benefit, ginger seems to have a warming effect: my hands and feet have been staying toasty warm even when there’s a winter chill in the air! Fresh ginger tea tastes spicy and delicious -- and you know you're drinking a quality tea when you make it yourself fresh! Feel free to make larger batches ahead of time if needed. 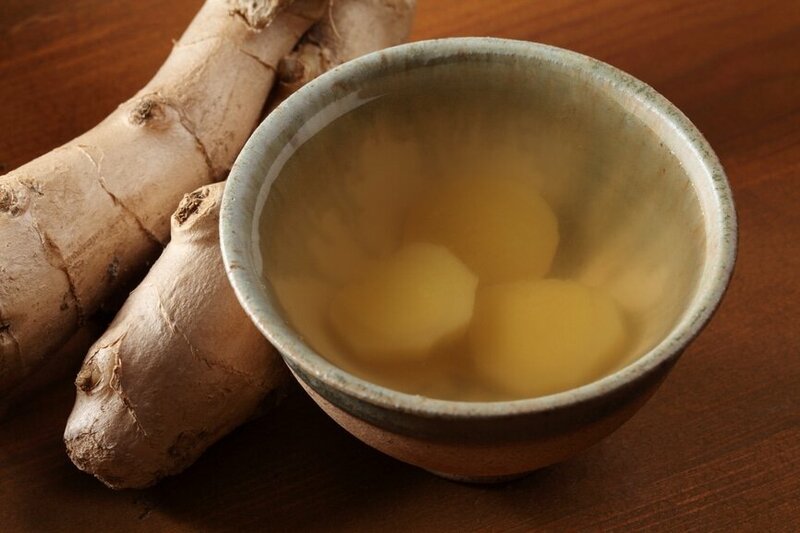 Peel your fresh ginger root, slice or grate until you have about a tablespoon. 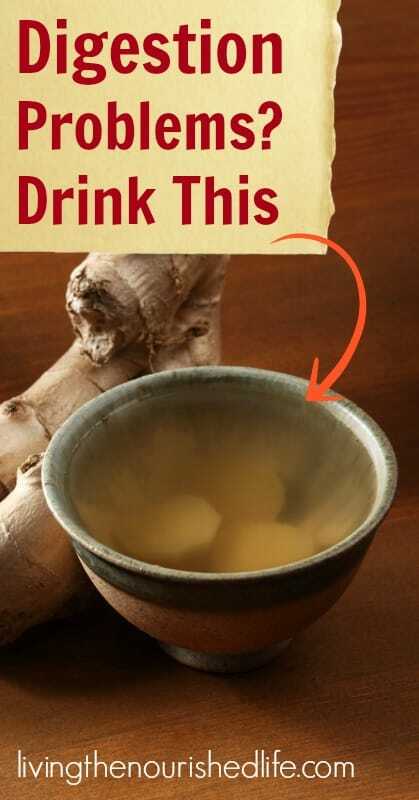 Bring water to a boil and pour over your ginger in a bowl or cup. Add honey and lemon if desired and enjoy! When you finely grate the ginger, it released more flavor and benefits into your tea. If you can't get fresh ginger, use 1/2 teaspoon of ground ginger per cup if desired. 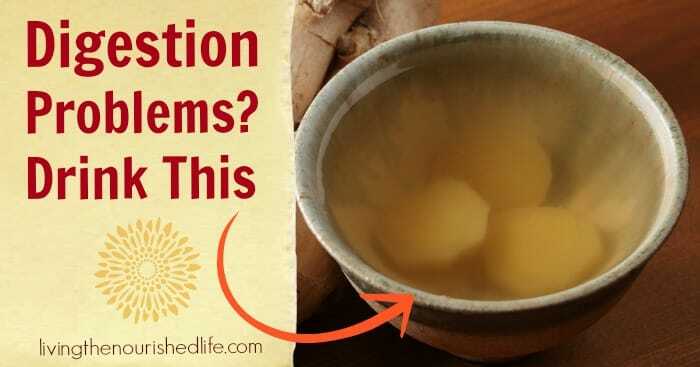 Love ginger tea, great for migraines too! But in general I enjoy a nice cup of ginger tea on a cold evening while relaxing after a long work day. I know — it is SO nice to have a hot cup of ginger tea on chilly days! Would ginger essential oil made into a tea do the same? Definitely! Any kind of quality ginger (oil, tea, fresh, etc.) should work for digestive woes. What about powered ginger? How much would you use? You can used powdered ginger. 1/4 teaspoon per cup is the typical amount used. I use to drink water whole day sip by sip and eat banana too. ginger is definetely a great a digester . but high fiber fruits like apple, papaya, and mango, watermelon. adds to help in digestion too. if you want to get rid of digestive problem so please love spices but in healthy wayy. like ginger tea. making masala tea by adding cinnamon stick , &cardamon stick. etc. and in salad like put fresh coriander leaves. olive oil or sesame oil but salad is must to eat if you had digestion problem and put variety of vegetables which you like but raw. so like that you can living healthy food yet simple but effective mine home remedy you can definetely get rid of digestion problem smoothly. If you make a large batch of ginger tea, would you just reheat it on the stove or microwave when you are ready to consume it? You can reheat it on the stove if needed. And don’t forget about chamomile tea too! Brewed right with the ginger would be yummy, or as an alternate. Chamomile can be a magical calmative for an upset GI, especially a stress-driven one. It’s antiinflammatory (like ginger), healing to the digestive tract, and calming for the nerves as well. Hope your belly settles down, and more importantly, that the stress does too. I have been reading so many benefits to turmeric as well. Good job adding it to your routine! I make a turmeric chai (w/cloves, cinnamon, ginger & coconut milk). Make sure to use an organic turmeric. I like that you mentioned that stress affects digestive health. I think that if you are under a lot of stress then you might want to take an occasional break so you can fix all of your problems and then you can see things from a different perspective. I think that taking vacations might also be a good idea so you can get your mind off of the things that you are stressed about. Definitely! I am a huge fan of downtime. A little every day, with bigger chunks of “off” time occasionally where you can just sit and reflect and rest. It’s amazing what a little rest and reflection can do for the way you feel!